Ranthambore National Park is the pride of Rajasthan Wildlife Tourism. It has never disappointed a wildlife lover or nature enthusiast. It won’t disappoint you. Ranthambore Tiger Reserve which is also now a National Park falls in the Sawai Madhopur district of Rajasthan. 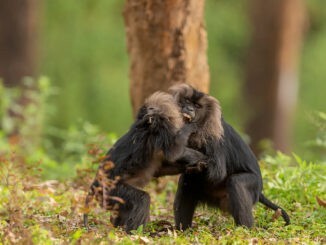 It receives its name from the grand Ranthambore fortress that stands inside the Park area. The Reserve covers an area of 392 sq. kms which includes 275 sq. kms of core area. If you have ever wanted to spot a living breathing specimen of these striped big cats, the highest probability of your dream coming true lies here. You can easily see some of them sprawling around in their natural territory even during the heat of the day. They are the much – famous Bengal Tigers. Ranthambore lies at an average altitude of 215 to 505 meters above sea level. It is at the edge of a plateau and bounded by rivers on two sides. On the North lie the cool waters of Banas River while the Chambal River flows on the South of the reserve. The climate is typical of Central India. The area of Ranthambore had been known as the Sawai Madhopur Gaming Sanctuary for long. This Sanctuary was established in 1955 through efforts of Government of India. Nearly two decades later, it came under the purview of then launched Project Tiger and became a Tiger Reserve in 1973. The status of the Reserve was further alleviated when Ranthambore became a National Park in 1980. New areas were added to reserve and it received additional funds from the Govt. for conserving and protecting its biodiversity. In 1984, forests surrounding the Ranthambore were made into Sawai Mansingh Sanctuary and Kaladevi Sanctuary. 1991 saw assimilation of these two sanctuaries into the Ranthambore Tiger Reserve. The Park is wildly popular and praised for its high tiger stats. However, that hasn’t been the story always. In 2005, Ranthambore was found to have only 26 living tigers in its ambit. This number was much lower than the 1982 recorded count of 44.Obviously, this was alarming. The Govt. quickly took to action. 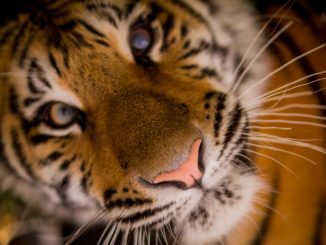 A large sum of about US$153 million was committed to protecting and conserving tigers in the Reserve. Forest officials came together and worked enthusiastically to change the situation. Villagers in the surrounding areas were handed out incentives for staying out of the Park. Surveillance cameras were fitted across the reserve and continuously monitored. The efforts bore fruits and the tiger count rose to 48 in 2008. Out of 48, 34 were adult tigers while remaining 14 were cubs. These incessant efforts played a major role in making Ranthambore eligible for participation in the Sariska Tiger Reserve relocation program. Under this program, some tigers were to be translocated to Sariska Tiger Reserve so as to help them in raising their tiger stats. 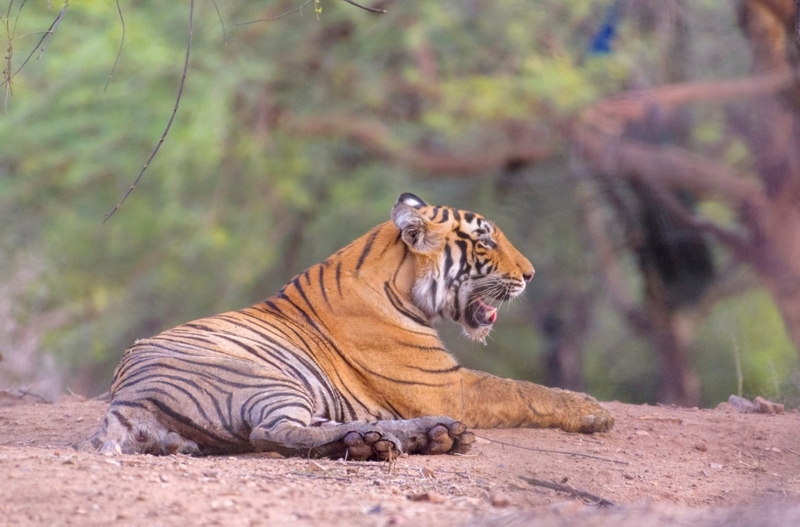 Sariska was sanctioned to receive male tiger Dara from Ranthambore. In the first ever aerial relocation, Dara was flown from Ranthambore forests to Sariska in a Mi-17 helicopter. Wing Commander Vimal Raj executed the operation on June 28, 2008. Unfortunately, Dara succumbed to poisoning on 15 November 2010. 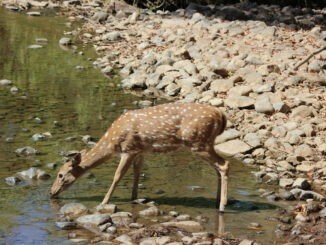 Wildlife: Ranthambore is home to multitude of animal species other than Bengal Tigers. 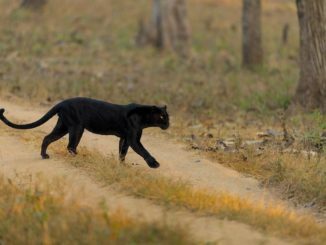 These include Leopards, Striped Hyenas, Jungle Cats, Tody Cats, Chinkara, Indian False Vampires, Indian Flying Foxes, and Porcupines etc. Common Indian Toad and the Common Frog are two amphibian species here. The park has high population of marsh croc reptiles including: Marsh Crocodiles, Cobras, Ganga Soft Turtles, Indian Pythons, Saw-scaled Vipers and the Indian Chameleons. Varied geographical terrain and abundant water bodies attract several beautiful bird varieties. You can spot Hornbills, Woodpeckers, Kingfishers, Bee Eaters, Herons, Storks and many others flying in the clear blue sky that arches above the Ranthambore horizons. All in all, there are 40 species of mammals, 320 species of birds, 40 species of reptiles, 02 amphibian species and 50 varieties of butterfly. Flora: Dry deciduous forests cover Ranthambore grounds as far as the eye can see. It has one of the largest groves of Banyan trees. A total of 320 plant species rejuvenate and bring to life the Ranthambore terrain. 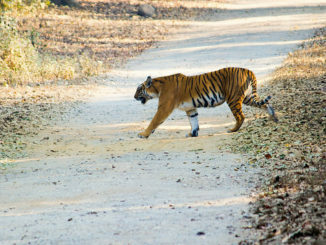 ‘Machli’ has been the most popular tigress of Ranthambore. She is also the most photographed tigress in India. She was named for the fish-shaped mark on her body. Machli shot to fame when a video of her duel with crocodiles surfaced on television. 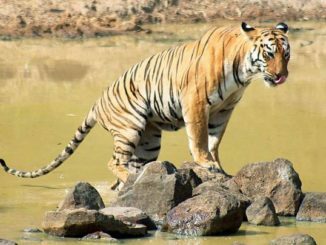 She was known as the ‘Queen of Ranthambore’ and ‘Lady of the Lakes’. She died on 18 August 2016 at the age of 20. 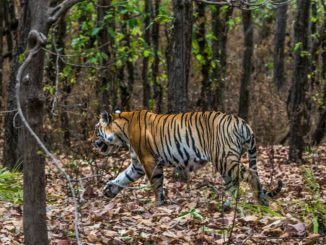 She is the longest living tigress in wild recorded ever. 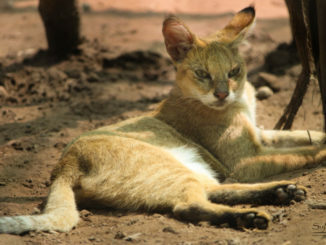 ‘Broken Tail’ rose to international fame posthumously when a documentary film based on his life aired worldwide on BBC. It was titled ‘Broken Tail’. He died in a train accident while sauntering from Ranthambore to Darra. His last journey is featured in the film. 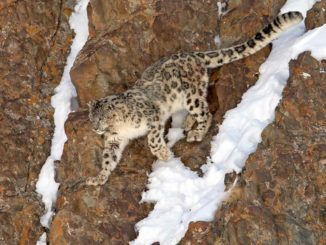 The ‘Dollar Male’ or ‘Zalim’, as he is known, stunned wildlife observers by tending to his two female cubs when their mother died of a disease. He broke all previously existing formal records that said male tigers play no part in rearing their cubs. 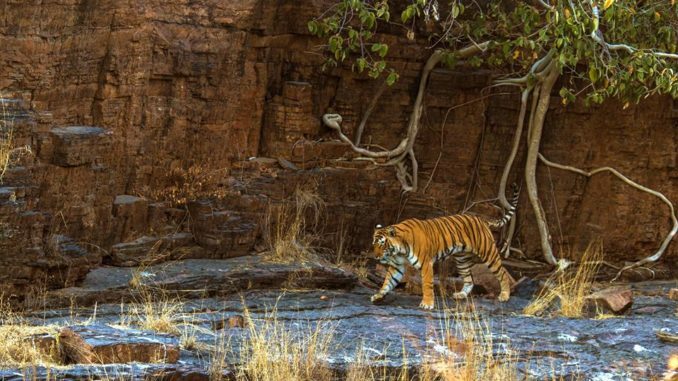 In the post Machli era, her daughter Krishna is the queen tigress of Ranthambore. Noor and Sultan are also very popular. Ranthambore Fort: Originally known as ‘Ranath Bhawar Garh’ meaning ‘home of Rajput warriors’ this fort was established in 944 AD. It is one of the most ancient landmarks in the region and attracts many heritage lovers. It has also been the favourite hunting ground of the most famous ever tigress of Ranthambore – the Machli. Fans of Machli, photographers and regular visitors, used to arrive here often to catch glimpses of her mighty moves. After her demise, the fort is hunting ground for her next generation. Fight for territory often ensues here which can give you glimpses of tigers in their royal action. 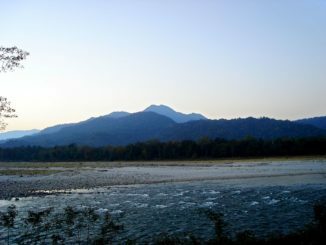 Kachida Valley: Located on the outskirts of the reserve, the valley has various low hill areas. This is the perfect place to spot Panthers. Ranthambore Panther population restrict themselves to this area and avoids venturing into the main parts, perhaps to avoid conflicts with other residents. 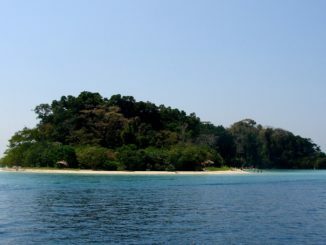 Bakula Region: It is one of the most densely forested areas of the Park. If you are a nature enthusiast and prefer to revel in the beauty of undisturbed nature, this is your home spot. The place is covered in thick vegetation and bears grave sense of wilderness. There are many pools and water holes that add to the cool effect and draw herds of animals. Ample availability of tiger spotting opportunities, rich vegetation and abundant wildlife makes Ranthambore one of the best places to ever embark a safari in. You can take up a Jeep Safari or hitch a ride on the mighty elephant’s back to tour around the wilderness here. Canter Safari is also an available option. Timings for safari vary according to season. A single safari tour usually last for about 3 hours. Tourists are advised to book their safari tickets in advance since the seats fill up very quickly here. You can easily book your safari online through the official website of Ranthambore National Park. By Air: Jaipur is the nearest Airport and well connected to all major cities in the country. It is 180 KMs away from the National Park. By Rail: Sawai Madhopur Railway Station lying on the Delhi-umbai trunk route is the nearest railhead to Ranthambore. The National Park is merely 11 KMs from here. 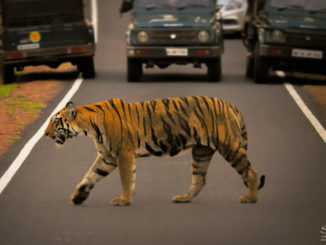 By Road: Hiring a car or taxi to Sawai Madhopur is the best way to reach the Tiger Reserve through road. It is 1.5 kms away from the Kota – Ranthambore mega highway.